The levy on Beedi leaves (1kg) will be increased to Rs. 3,000. Excise duty on locally manufacture alcohol will be revised form midnight today. The price of a cigarette will increase by Rs 5, The tax on cigarettes will be revised from midnight today. All 60mm cigarettes will be subject to a 12% Nation Building Tax from June 01. Expressway tolls will increase by Rs. 100 during rush hour. Citizens have the ability to customize their vehicle number plates. Chargers for one day service for passports will increase to Rs. 5,000 and the normal service will be at Rs. 3,000. 100 million allocated for the production of jaggery and toddy bottling industry in the North and East and 300 million allocated for the rehabilitation of giant tanks. 200 million to the office of reparations for awareness programmes on Communicating out reconciliation efforts and set up office. Finance Minister invites diaspora and others to donate the “Palmyra Fund” to develop the war torn areas in the country. Royalty payments for artists to be implemented enabling artist to receive royalties for their creations. 50 million allocated for the growing of mangroves in an attempt to mitigate climate change effects. 4:10pm 3lakhs allocated for Solar power projects to establish solar power in temples. 4:09pm Appropriate replacements will be introduced before September 1, with the aim of discouraging single-use plastic products. 20,000 million allocated for disaster management. The installment will be increased to 1,500 million and The Natural Disaster Insurance will be strengthened. 4,5000 million allocated for Work on 15,000 brick and mortar houses in the Northern and Eastern Provinces will be commence work this year. And 5,500million is allocated for these initiatives. State employees salaries have increased by 107% as of 2015. State employees will also have an increment of Rs. 2,500 from July. Rs. 10 billion has been allocated to develop rural roads. 1,500 million allocated for Prepaid card and GPS centered bus system and a central digital platform for bus service will be established in the future. 250 buses will also be added to the SLTB. Buses that are accessible to differently abled persons will be introduced. 1,000 million for the beautification of the city of Colombo which is being carried out by the CMC. Housing rent allowance for security forces personnel to be increased by 100%. 2.5million allocated to maintain environmental sustainability,student and community societies will be established. 10,000 million allocated to remove the Samurdhi fund. We are giving each Samurdhi beneficiaries access to their accounts to withdraw Rs. 30,000 twice a year. ‘Sihin Maliga’ loan scheme for expatriates to commence from next month. Rs 250 million to be allocated for National Export Strategy. 45,000 million will be allocated for drinking water projects across the country. Commandos Allowance to be increased to Rs 5,000 per month (Sri Lanka Navy and Sri Lanka Air Force) , increase their housing allowance by 30%. 2,500 allowance to given to state sector employees from July 01 this year. 5,000 million allocated for the Light Rail Project from Colombo Fort to Malabe,will commence work this year. 25 billion for development of university infrastructure and 32 billion allocated for development of school infrastructure. 3,000 million has been allocated for the Sukitha Purawera programme. 8,000 million allocated for the urban rejuvenation programme. Colombo is now becoming the garden city of Asia. 750 million allocated for development of Bogambara prisons , and it will be made a public place. 10,900 million allocated for the creation and maintenance of urban wetland projects. As of January 1, 2020,Construction of new buildings should be accessible for differently-abled persons. Permission will only be given to plans that include accessibility for disabled individuals. 1625 million allocated to developed emergency care for patients. 300 million each to develop the Bernard Aluwhiare grounds in Matale and another in Kollonnawa. 100 million is allocated for sterilisation programmes ,it will be established. To complete the canals and headworks of 7 major projects in 2019 (Deduru Oya Project, the Menik Ganga Reservoir Project and the Morana Reservoir Project) and for the 21,000 families engaging in Agriculture 2,410 million has been allocated. Students who have excelled in studies will be given internships to top-notch universities by offering 14 students on internships this year. In selected Army camps NVQ certification facilities will be implemented. 400 million has been allocated to train teachers in Tamil medium. Cost of construction will be reduced with the removal of the Nation Building Tax. 100 million allocated for training programmes, training for teachers which will be conducted during the school holidays. 32,000 million will be allocated to construct labs, library and infrastructure. 250 million will be allocated for the launch of the export market access scheme. 300 million allocated for ,Art stream graduates (1000) will be trained as interns, and the government will pay 25,000. Home Sweet Home loan scheme for newly married couples. We have utilized resources to resettle Muslim refugees in the North. The Minister said that drug addicts who go into jail come out as drug peddlers. 50 million will be allocated to set up areas for prisoners, in Ambepussa and Weerawilla and will make a village in Dompe to teach women prisoners arts and crafts. 50 million allocated for a pilot project to provide skills to imprisoned women in the country. Steps to be taken in order to increase the number of women in the country’s work force. The Labour laws will be amended to achieve this, said the minister. 4,320 million will be allocated for monthly allowance for differently abled persons to be increased from 3,000 to 5,000. To accommodate the differently abled and the private sector will be invited to maintain and manage them. Free glass of milk for primary school children across the country. Farmers in Hambantota and several other districts. Rs. 250 million has been allocated and storage facilities will be in Kattipola, Jaffna and other districts. Rs 800 million allocated for growing new rubber trees increasing rubber tapping. Religious centers will be increased to 10 lakhs from 5 lakhs. Imports were 10% of the GDP while the exports were 14% of the GDP. The Government allocates Rs. 500 million to create a fund to help entrepreneurs. Finance Minister Mangala Samaraweera begins delivering the second reading of the Appropriation Bill. Minister Mangala Samaraweera will present the Budget - 2019 at 2:00pm today in Parliament. 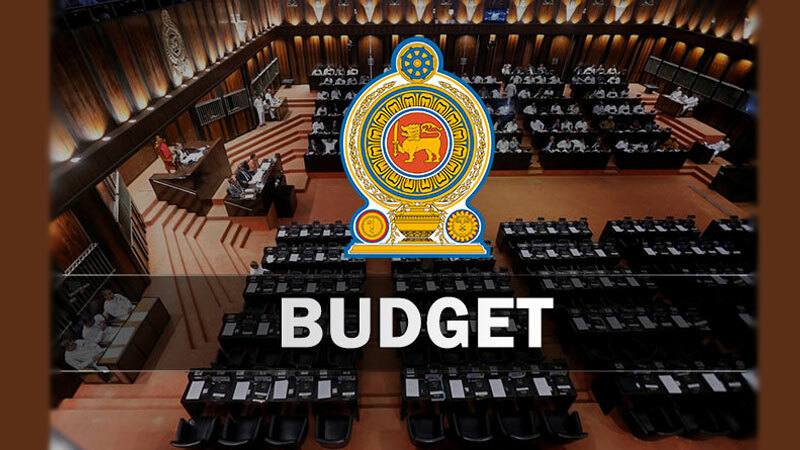 The Government’s fifth Budget that will be presented in Parliament by Finance Minister Mangala Samaraweera today will be aimed at empowering the people and nurturing the poor apart from catering to the basic educational, health and livelihood requirements of the population. Today’s Budget will widen the entrepreneurial and human resources empowerment programmes under the Enterprise Sri Lanka programme.